Copper dies are becoming harder and harder to source within the industry due to high level environmental production requirements. But due to Profoil’s commitment to the environment and strict waste disposal policies, we’re still able to offer copper dies. Copper has many advantages over magnesium, brass and aluminium. 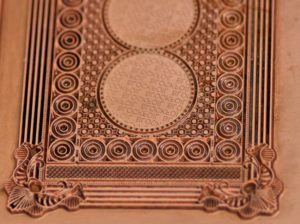 The main advantage is that copper foiling dies can hold intricate details of images, especially thin over-lapping lines and small fonts, much better than magnesium as the material is harder and produces thinner shoulders. Copper dies are produced by using the same advanced UV light & chemical etching process as magnesium dies, so they also have the same benefits over CNC brass production. CNC tooltips can struggle to handle ultra fine detail images and additionally, this process is faster than CNC machining. Due to the increased strength over magnesium, copper is very durable therefore perfect for medium to long stamping runs, coupled with the excellent heat conductivity, this ensures consistency throughout your foiling run. How to order – simple and fast online ordering. 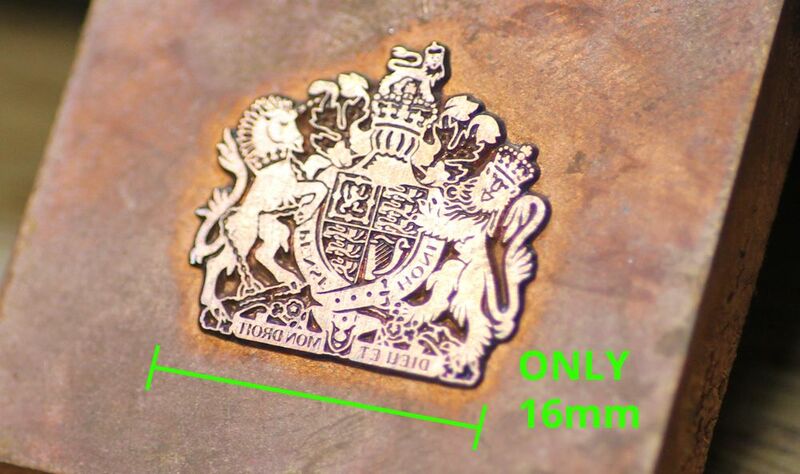 Using Profoil’s unique and fast online ordering system, we can dispatch your copper dies within just 2 days. After choosing your required gauge size, enter your artworks maximum point to point width and height; this will calculate the total price of your die. After adding to your basket, you will be directed to upload your artwork and complete your order online. All artwork files are manually checked by our team and our dies are checked for consistent quality through the manufacturing process. 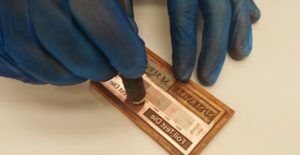 The aftercare of copper dies is essential to maintain a quality finish – unclean surfaces can cause reactions to foils and substrates, which will impact the foiled finish. Copper foil stamping dies are produced using highly corrosive acids and therefore it’s not uncommon for chemical residue to remain on the top surface of the die. If dies are left for a long period they naturally oxidise with the air. Before each use it’s important to clean and polish the dies either with a glass fibre brush or Garryflex block. For more information on cleaning, see our die cleaning guide.